The US Navy has been at the forefront of naval aviation at sea for almost a century, its aircraft carriers growing ever larger in size over the decades. A powerful force projector in both war and peace, the combat carrier has evolved to keep pace with modern technology and changing threats. Today’s nuclear behemoths of 100,000 tons can trace their lineage back to the converted battlecruisers of the 1920s and 1930s, which were the first truly modern carriers capable of operating close to 80 airplanes. This volume charts the development of US Navy fixed-wing and helicopter carriers throughout the Second World War, the conflicts in Korea and Vietnam, the Cold War and the ongoing War on Terror. 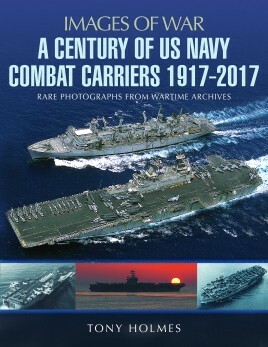 Carriers such as Saratoga, Lexington, Enterprise and Constellation all feature in this volume in photographs that have been carefully sourced from official and private archives from across the globe. Each image has a detailed caption that chronicles the exploits of these ships - the robust and impressive combat carriers of the US Navy. A Western Australian by birth, Tony Holmes was a published aviation author by the age of 20. Moving to England in 1988, he has worked in aviation publishing ever since. Tony has written more than 50 books and edited a further 300 in the past 25 years. Passionate about naval aviation, he has conducted more than 30 carrier embarks on US Navy and Royal Navy vessels across the globe, including nine visits to supercarriers sailing in the waters of the Northern Arabian Gulf whilst they were conducting operations over Iraq and Afghanistan.